Continuing the theme of creating something useful from discarded containers (remember the castle from last week? Or, the hamper from last year?) 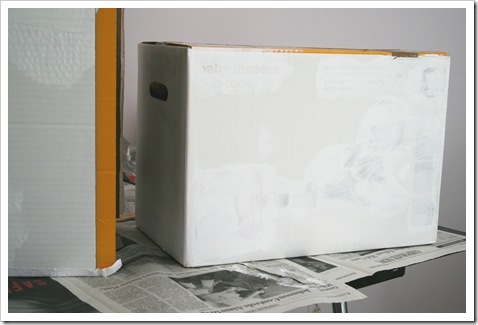 I wanted to share yet another way I am using old diaper boxes. You may have glimpsed the storage on the upper shelves of the laundry room in the pictures I posted Friday about that remodel in process. There is one up there to the left side of the window and…. …another on the right side. They are being used as storage for seasonal items; mainly our pool gear, towels, toys, swim diapers, etc. This spot is a little far out of reach. Even with all of my 5 feet 9 inches I can just barely pull them down, so I don’t like to put things I need to get to very often up that high. 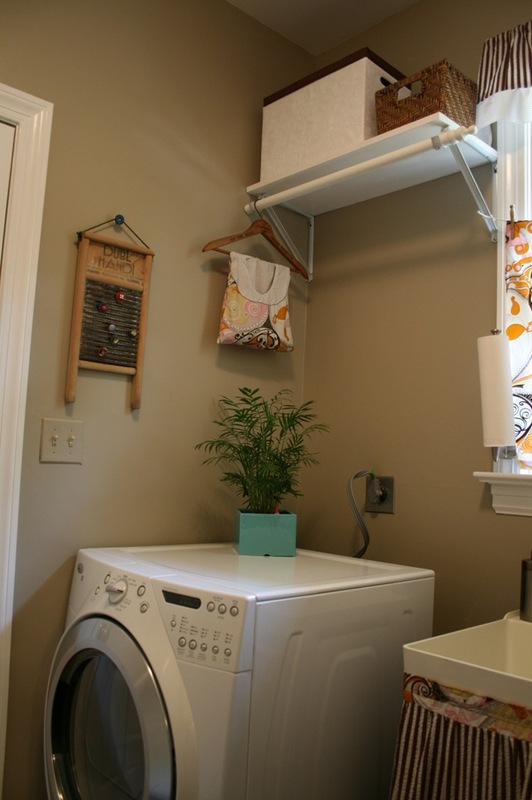 I tried leaving the shelves empty and then considered just putting some plants up there as I did on the dryer (see shot above). Plants always add something nice and fresh to a space, I think. Since I prefer to use live plants I decided that trying to get up there to water them might lead to dead plants. Just bein’ honest. I’m lazy like that. After some hemming and hawing I decided storage was in order and it definitely needed to be for something I only needed to access once in a while. Also, because this is an entrance into our home, albeit our private entrance from the garage, I still wanted things to be pleasing to the eye when you walked in. 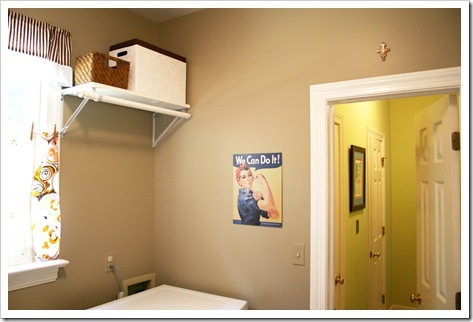 We can’t hide the washer or dryer or the ugly plugs or water hook-ups. So, I have attempted to make things decent in all the other areas. I already had the little wicker baskets (from Target, of course!) holding our dog’s brushes, old collars, leashes, flea repellents, you get the picture and I wanted something similar. Well, once you move past the itty-bitty sizes in those square storage baskets the prices really start to go up. At the time I was looking I was seeing $40.00 plus dollars for each covered basket. And, since this was not necessary storage, just “I want something aesthetically pleasing to fill the gap” storage I could not justify spending nearly $100.00 to make this far off area pretty. Plus, I’m simply cheap. 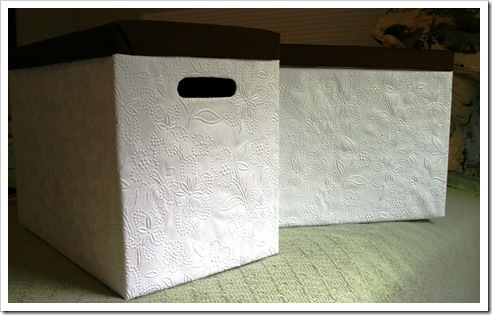 Out with the cute matchy basket idea and in with the diaper boxes. We only have what seems like a million of these things hanging around here. 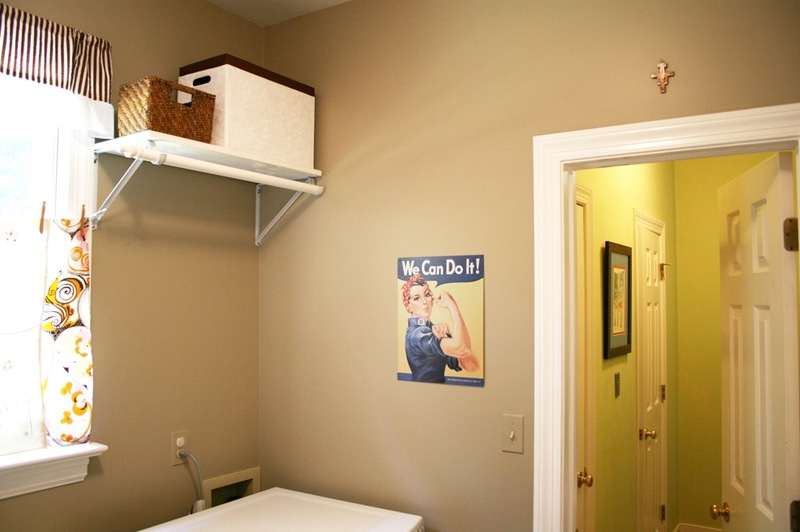 You can’t open a closet in this joint without seeing a diaper or wipes box shoved in, either to store it for a later use or because it’s being used to store something else. I know I’m not the only one…who’s with me here? Can I get a Hallelujah? First, I pulled together two decent, non-dented or scrunched, 144 count sized boxes and a third that had decent top flaps. 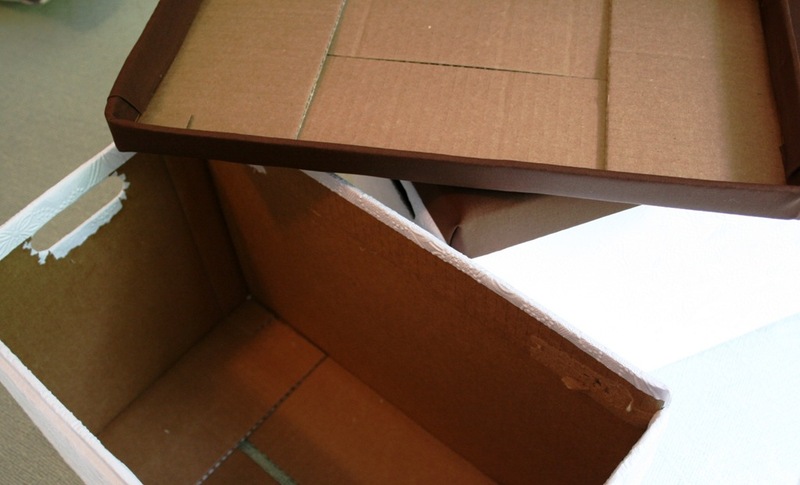 Then I used the packing tape to close the top flaps of the two nice boxes. 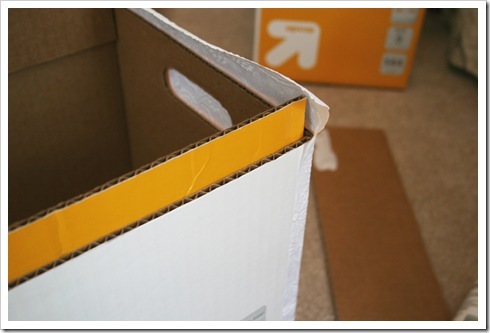 You will want to take your time lining the flaps up and making the tape neat and tight because this will end up being the top to your finished box. Next, mark a line about 1.25 inches down from the top of the box all the way around. (Remember these measurements are for the boxes pictured. 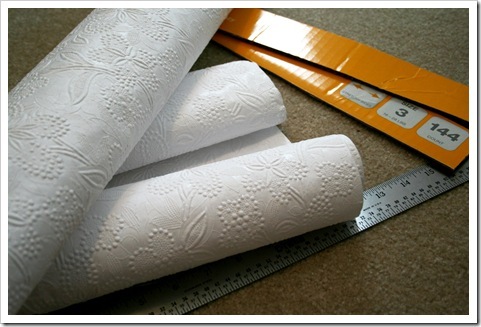 You will need to adjust the measurements to suit your needs.) I wanted to save the end handle space for my final product so I left a bit of room above the handle hole for stability. I would probably go wider if the handles were not in play, just for visual balance later. 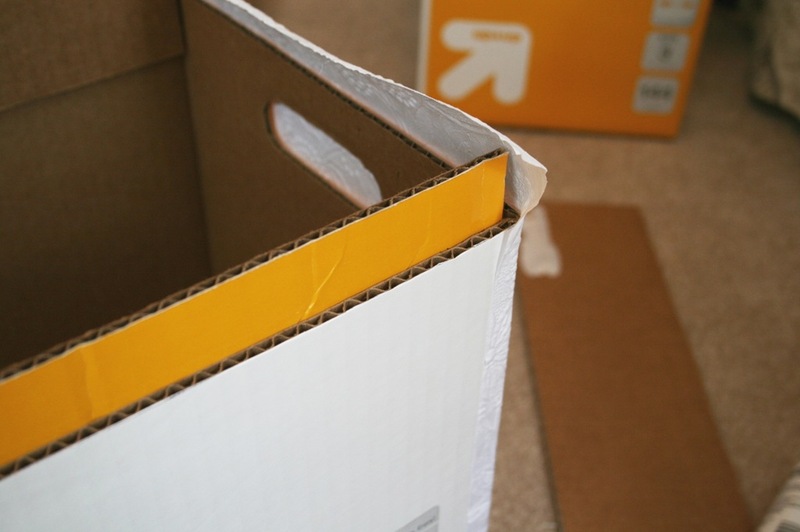 If you don’t want to use the handles, push the cutouts back into the sides, smoothing them out as much as possible and then cover both the outside and inside with the packing tape. The goal would be to get the smoothest end panels as possible. I just followed along the fold line and removed the flap completely. 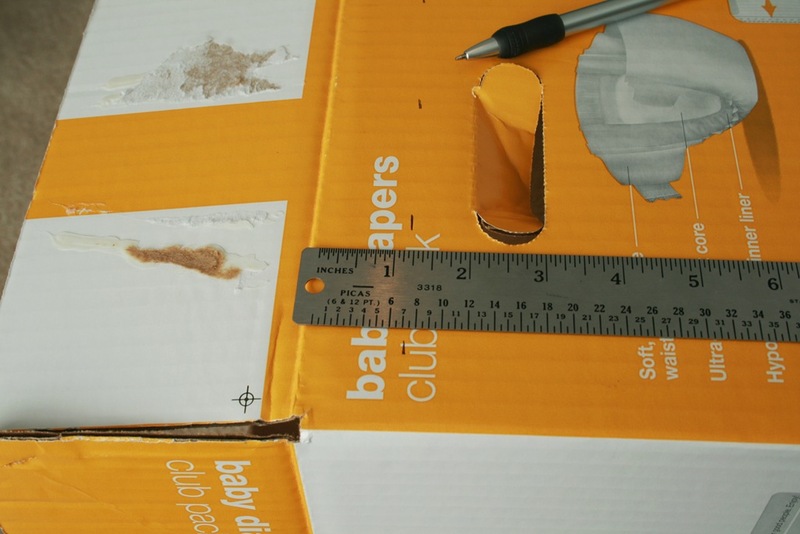 Use the utility knife to cut along the line you marked all the way around the sides of the box. 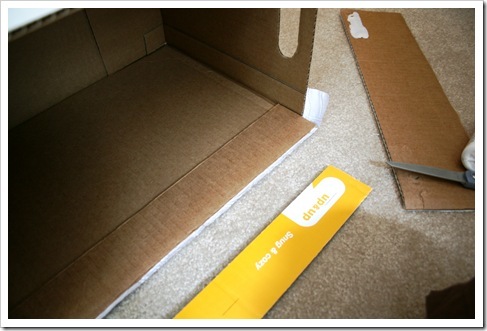 Take your time in doing this and employ light pressure and several passes to get through the cardboard completely. Going slowly here will ensure straighter, less jagged edges and no loss of fingertips. Once you have cut through your line you will now have a skinny top and a nice little bottom. 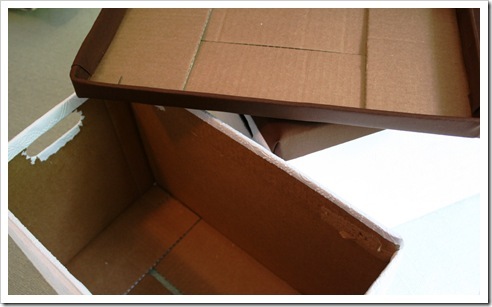 Next, carefully remove the top flaps of the third box. 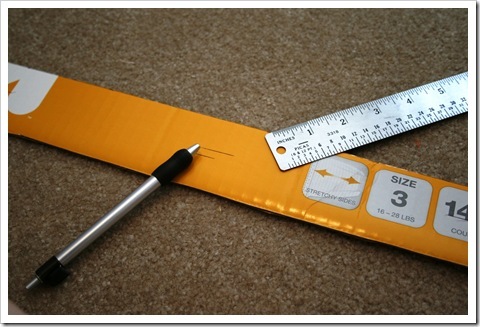 Measure and mark a line down the middle of the flap length and then cut the piece in half. 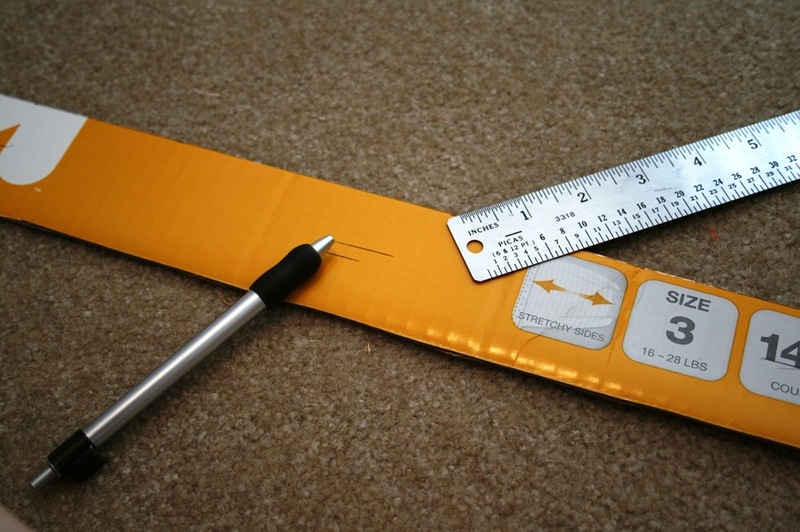 Now, mark a line about 1.25 inches from one of the edges. 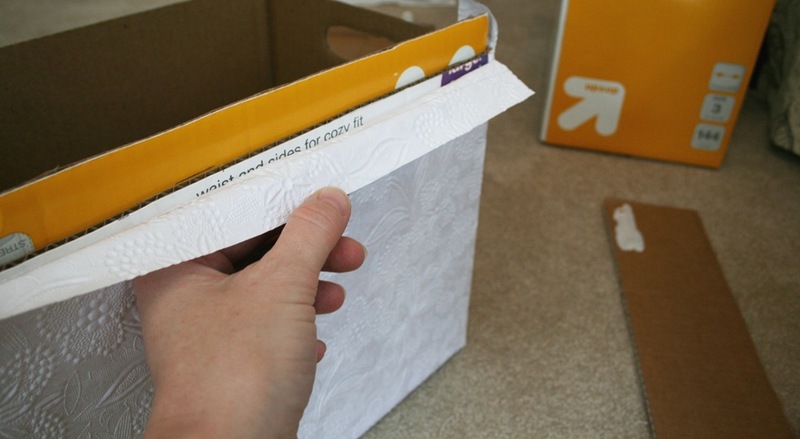 Make two of these flaps for each box and set them aside for later. Be smarter than me and prime over the cute little crawler and any other dark or bright markings on your box. I just used some flat white wall paint that was leftover from the nursery project to hide the images. Initially I thought the extra thick paper I used would cover the markings on the box, but after gluing down one side it became obvious that the little baby would be mocking me from high above as I folded pile after pile of laundry. 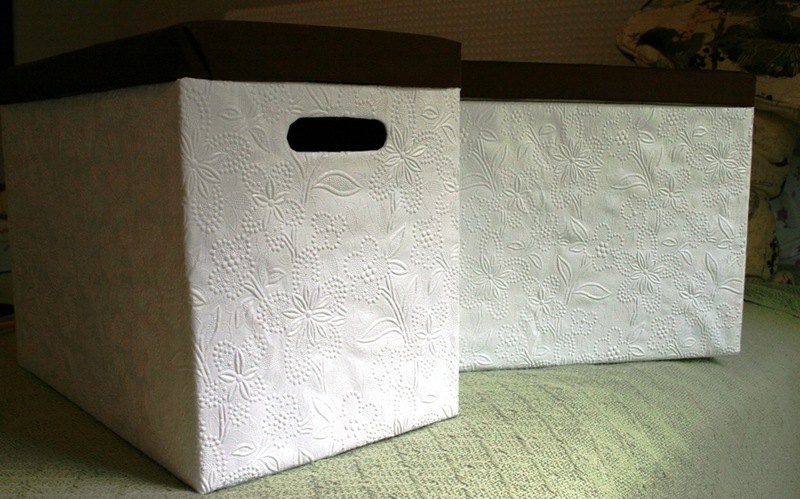 NOW, get out your paper or fabric and start covering your box! 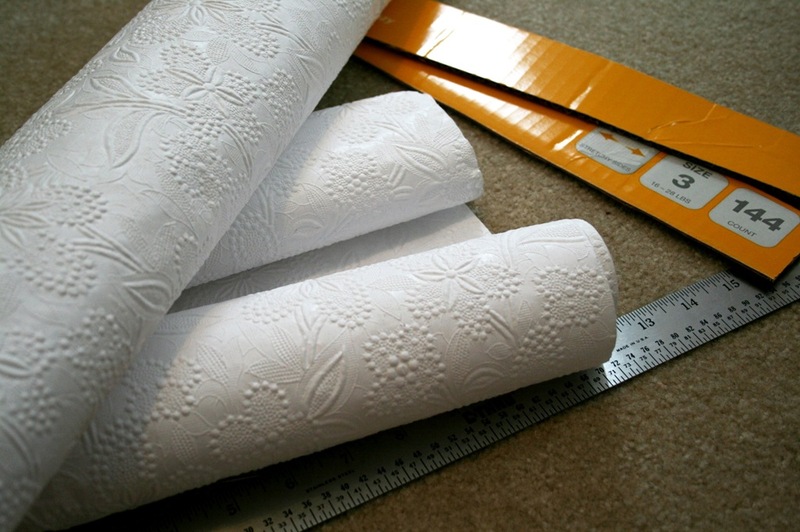 I found this cool, white on white embossed paper at a local thrift store for $1.50. It was an unopened roll from Hallmark and you know it was waaaaay more than a buck, fiddy brand new! 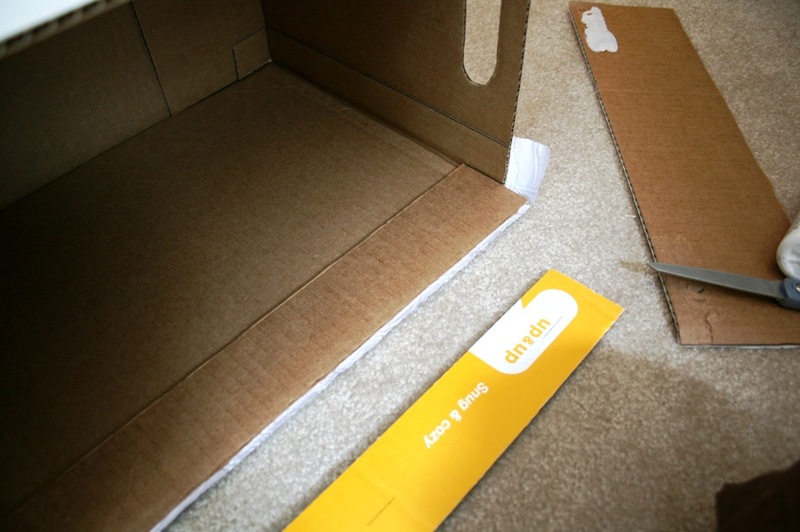 I just placed the box on the paper the same way you would when wrapping a gift, and did some quick marking with a pencil to know where to cut. Once I had cut out the first piece I used it to cut three more. This was after realizing one piece would go around one long and one short side of the box, with enough extra to turn under the edges. This made for easy placement after rubbing a glue stick all over each side of the box. By the way, I did not cover the bottom, but I did add enough along the top edge to wrap around the box lip. 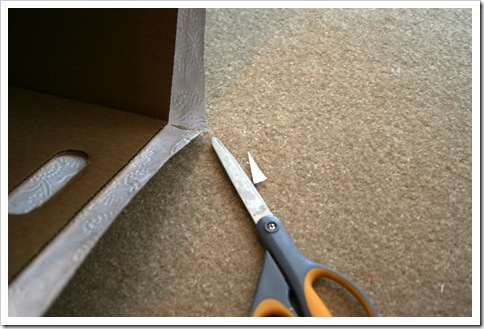 I cut a tiny sliver out of each corner before wrapping over the lip of the box. …and here is a closer view. 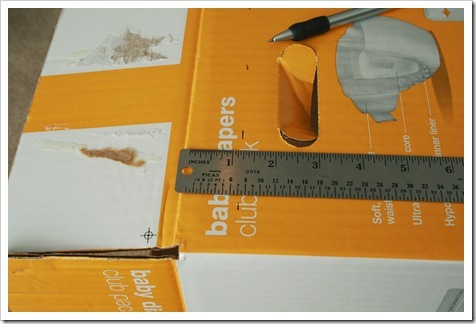 Now, continue to glue and wrap the paper around the sides and edges of the box. 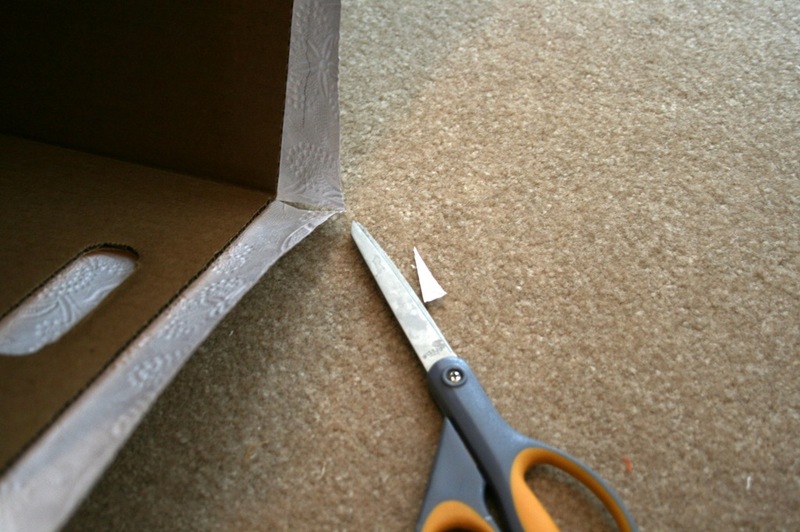 If you are using the handles, carefully make slits from the center of the circle cut out to the edges and then pull the paper flaps back, gluing them to the inside (see picture below). 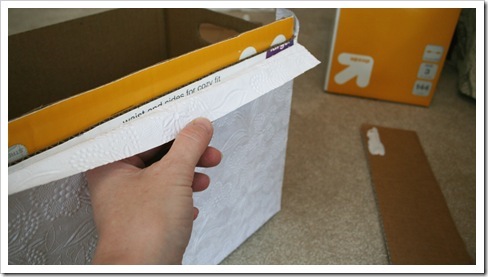 At this point you will want to wrap the box top in either the same paper or fabric used on the bottom portion of the box or in a contrasting paper or fabric. I chose to use plain dark brown cotton fabric found in my stash and I added a panel of batting to the top only. Then I wrapped the the fabric around the edges and glued along the inside. For convenience I used hot glue to hold all the paper and fabric edges into place. This allowed me to keep moving with the project without fear of the edges coming loose or moving. Which also meant I was able to finish this project in one afternoon while the Little Guy took his nap. This is what you end up with. Not bad for simple storage. Even better that I owned all the supplies already, so it felt pretty free. Yeah! You can just barely see in the picture below, how the batting adds a little bit of loft and curve to the top of the box. Because the top is so thin I felt like it needed something to give it a little more weight. Especially with the dark color. Now, when that band of brown catches my eye as I walk into the laundry area it appears to be more balanced with the bottom portion of the box. Here they are again in their new homes. 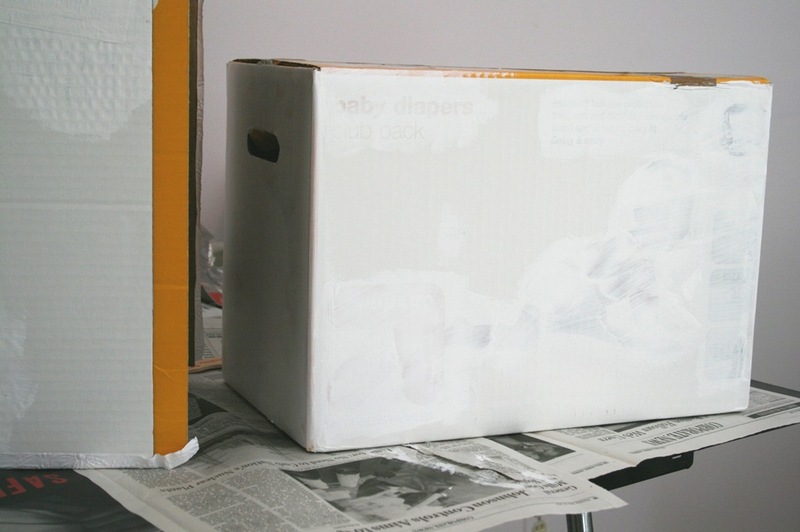 Have any of you come up with good ways to reuse diaper boxes? There are probably whole websites dedicated to this topic. Hmmmm….maybe I will head on for some Googling now. oh, that sounds dirty, doesn’t it? sorry…. Wow! 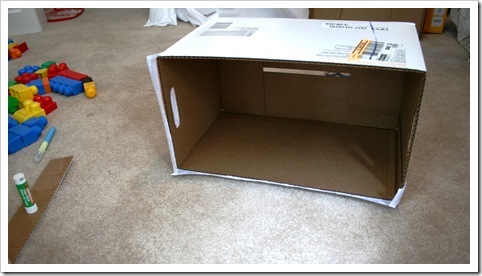 great reuse of your boxes! 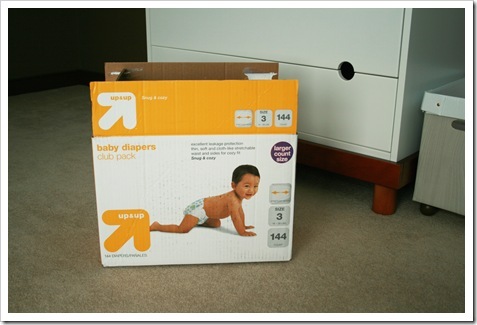 No diaper boxes here, but we have a number of sturdy boxes we used during the move that I would like to use for something. 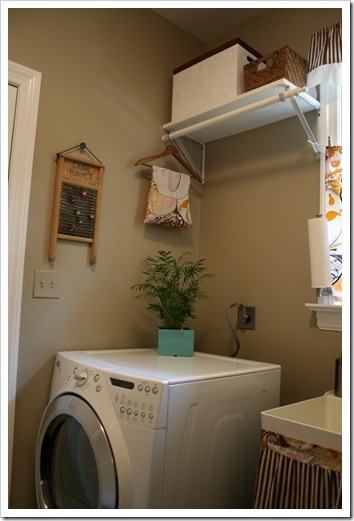 And I LOVE your laundry room! The curtain (and all the matching accessories) is adorable. Kimberly- thanks for the compliments! 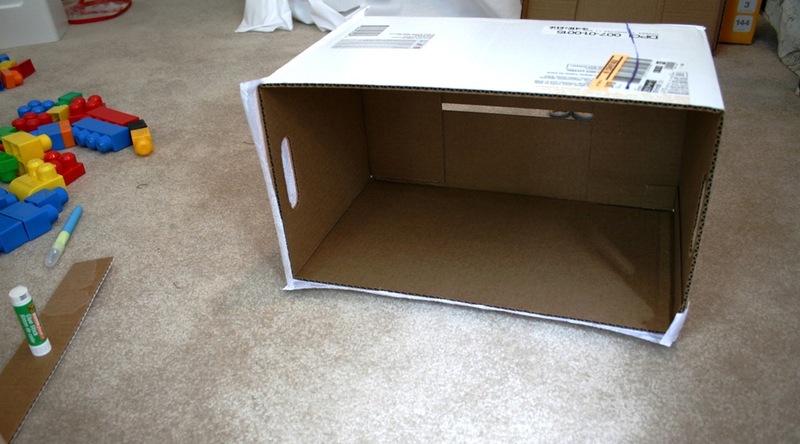 Great idea for the box- you could do a whole set if you wanted to! I would steal that idea in a second, but my mom bought the Little Guy the IKEA kitchen for Christmas last year. He loves cooking with me. You will have to post pictures if you make that oven. Can't wait to see them!